Talk About Tunes: The can is filled with discussion starters. Some of the questions are easier than others. Some require higher level thinking and problem solving. I'm always looking for ways to add opportunities for meaningful learning conversations to take place in our classroom. 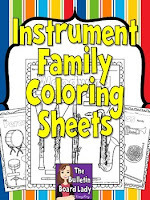 Worksheet Workstation: This station usually contains a simple worksheet that allows students to demonstrate one of the concepts we are learning in class like note identification, instrument families, etc... This station is usually just for 2nd grade and up. I'm often sitting at this workstation to help students in small groups and assess their understanding of the material. Okay, I must admit that sometimes it gets rather loud in the music room. The sound of learning is amazing! I could listen to it all day long! At this workstation students get to sing, sing and sing! At this center, students take turns picking a letter. Everyone in the group covers that letter and they all sing the alphabet song together. When they get to a letter that is covered they say "SHH" instead. So much fun! You might also like this Pinterest Board. Follow The Bulletin Board Lady-Tracy King's board Music Class -Centers on Pinterest. Bop It is a fabulous game to use in the music room ! I wish I had a couple more! Depending on which version of the game you use students can work on rhythm or sound/pitch recognition and strengthen their patterning skills. The coordination it takes to successfully get through an entire round is challenging and fun! When I moved to this school last year I was delighted to find a great classroom library in the music room! We use the books for a variety of purposes. We sing the books, we do rhythmic activities found in the books, we create accompaniments and add sound effects, we use them as inspiration for movement, we learn about music history, etc... At this workstation students are free to explore the library and read a song! For teachers: If you are interested in some worksheets that go along with a few of the children's literature lessons go HERE and scroll down to the bottom. The coloring station in the music room provides student with the opportunity to express musical understanding while incorporating math, communication arts and visual arts. Sometimes we will color pictures of instruments and practice writing their names. Sometimes we'll color patterns of music symbols or notation. 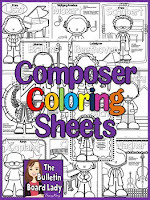 We also color pictures of famous composers, illustrations of song lyrics and complete worksheets like color by note or color by instrument. Find TONS more in my store by clicking HERE. Do you know Brian Weese? Well, he's brilliant music educator! This turkey rhythm worksheet is fabulous! It allows student to compose rhythm patterns on turkey feathers. I did this with 1st and 2nd graders. Then I modified the activity for Kindergartners and we made Steady Beat Turkeys. We don't usually worry too much about notation in Kindergarten at this time of the year, but this really worked with the steady beat activities were were already working on. Students had a great time composing and sharing their turkey rhythms with classmates. So...I had some silly plastic eyes left from Halloween. Now they are a practical and hands-on way to practice rhythms in music class! In this center students are asked to pull a rhythm out of the hat, show it to their group and then clap and say it. If they do it correctly (as evaluated by their peers) then they get to keep it (the blue containers in the picture are our eye catchers :-D ). The game ends when its time to move to the next center or when all the eyeballs have been used. The person with the most is declared the winner! We are working in centers this month! Students in Kindergarten, First Grade and Second Grade are working with a variety of materials to strengthen their musical aptitude. We are so fortunate to have 2 iPads to use in the music room. This month, students used Falling Stars to create music. Download this free app for iPhone or iPad here. This semester students in 5th grade will be working on Music Burgers. A Music Burger is a way to write about a listening piece using music vocabulary and a personal opinion/memory. It helps students write a complete sentence and then combine those into a paragraph. The burger is a graphic organizer for building a paragraph. In music class today we listened to "Overture" from the opera William Tell. Its composer is Rossini. There was a trumpet solo at the beginning. There were a lot of string instruments and no voices. The tempo was fast. The dynamics changed constantly. Most of the time it was forte. This piece of music made me feel happy. Rossini wrote an opera about William Tell and we listened to "Overture" from that opera. This song did not have any singing. It was fast and exciting. There were many instruments in this song. I didn't like this song because there was no singing. We just listened to a song called "Overture" by Rossini. We heard a trumpet at the beginning of the song. The speed of "Overture" is fast and it doesn't change. I think he wanted to make us feel excited. The music was both loud and soft. I liked this song because it reminds me of being at my Grandma's house watching The Lone Ranger. We'll do a few more Music Burgers as the year goes on. Check back for more student samples. Teachers: Get the music burger here. Using Artie Almeida's lesson on William Tell's Overture to explore form and play classroom instruments. This week GES 2nd graders used maracas and coffee can drums and noodle ponies to show their keen listening skills. Each group listened for a specific part of the song. When they hear their part they played their instrument to the steady beat. If they had a pony the used their feet to keep the beat and "rode" the ponies around the room. What fun! In the picture above you can see the two instrument groups on the carpet and the ponies marching around the chairs in the back of the room. Teachers: You can get Artie's book here. Learn more about making noodle ponies here. First and Second Graders explore form and perform on coffee can drums, maracas and jingles. At our school 4th, 5th and 6th graders are eligible to join our elementary choir, the Bearytones. This month my bulletin board in the hallway celebrates these amazing musicians. The title says "I MUSTACHE you a question! Have you seen these choir members?" The choir members are then pictured wearing fake mustaches that I made using those foam sheets with adhesive backing. The kids had a great time and everyone loves the board. You can find more great bulletin board ideas HERE.